Growing up in Brighton during World War II was not much of a childhood, I was nine years old when war started and I had one older and two younger sisters. My mother was left as a widow in 1941 when my father passed away after an illness. We had a ladies dress shop in Kensington Gardens and we all lived above. The accommodation really was not suitable, it had no bathroom and the toilet was in the yard. But we stayed there because my mother wanted us all to be together as she was anxious about the war. Because we had no bathroom we had to go once a week to the Public Baths, I think it was sixpence each for a bath. My mother cooked in the basement; it wasn’t a real kitchen but it did have a stove. Up a few stairs from the ‘kitchen’ was a room that my Mum made into a dining room, it had a gas fire. My mother was worried about the Nazis as we were Jewish and the Germans were already in France. She told us if they ever reached England she would put the gas fire on, and we would sit around it and go to sleep. She thought that would be better than what the Germans would do to us. I remember My Mum buying chocolate wafer biscuits and hiding them in a showcase in the shop. To this day I don’t know where or how she got them. Rationing was hard, but especially for children who really did not understand why they could not have what they wanted. I used to tell my sisters to put one sweet in a tin when they got their rations and I also did it of course. When the tin was quite full of different sweets we shared them out. Of course kids love ice cream, but you could not get the real stuff then. Next door a family of Italians had an ice cream shop; normally the only ice cream they could make was more like cold custard. But once in a while they made the real thing and they always gave us a little – what a treat! 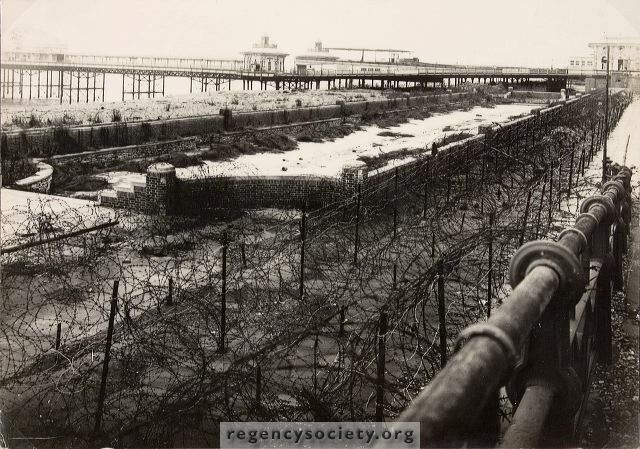 My mother’s side of my family lived just off the seafront in Hove during WWII and I always heard how my Grandfather sat for a few weeks at the bottom of the stairs, facing the front door, with a WWI helmet on his head, in his long johns, and a shot gun in his hands. He was determined to take some Germans with him before they got upstairs to his wife and daughters, if they decided to invade during the early days of the war. It seems hard to believe nowadays, but such was the feeling running through the minds of people who had already survived WWI, the “war to end all wars”. Fortunately all the family survived WWII as well.